Beauty tips from my friend, Coleen Barack, Medical Aesthetician at Anne Arundel Dermatology Skincare Studio. Limit sun exposure as much as possible, make sure you use a good sunscreen of at least SPF 30, and wear a hat and big round dark glasses. Anti-aging treatment in a doctor's office such as microdermabrasion or chemical peels. Again, these treatments are most beneficial for stimulating collagen and elastin and allows deeper penetration of prescribed skin care products. Good diet and exercise and drinking plenty of water are a must. Getting at least 8 hours of sleep each night and plenty of relaxation is important. When you apply your make up, some steps have to be done in order. Other steps do not. Cleanse your skin and apply your treatment products (Serum, Moisturizer and Eye Cream) followed with a primer, using your fingers or foundation brush. Apply your foundation immediately, using foundation brush "a" I like to use it damp, so the foundation is sheer. Wash it with a bar of soap, when you wash your hands each time that you use it. Stroke from your nose out to your ear on both sides and then down on the lip, chin and jaw line. On the forehead stroke from the center out. No need to put foundation around your eyes. Apply lid primer on the eye lid with the camouflage/concealer brush. After your eyelids are prepared with the lid primer using brush, powder them with a makeup wedge sponge. You will eventually put concealer under the eyes with the same brush. (I wait until all of the other eye make up has been applied!) Wash it with a bar of soap, when you wash your hands each time that you use it. Brushes used to apply color (powder, blush, eye shadows) should be tapped off on a tissue to avoid taking too much to the face. Face powder should be applied with powder brush. Do the T-zone primarily (forehead, nose and chin) and then very lightly on the cheeks. Blush should be applied to the cheeks with the blush brush and a smile on your face. If your face is square or round, apply the blush just under the apple and up higher toward the ears/temple. If your face is oval, apply it on the apple. If it is narrow, apply it on the apple and then rather straight back. I then take the foundation brush, still damp from applying your foundation and tap the blush to soften the edges and give it a luminous look. If using cream blush, it is applied before face powder. Powdered blush is applied after face powder. With the texture brush or the fan brush, apply bronzing powder starting at your hairline center on your forehead, in the shape of a “3”, to your cheek and chin on both sides. Then in the shape of a “w” across your cheeks and bridge of your nose. Next using the angled eye brush, apply your light eyeshadow shade under the brow. Depending on your eye shape the other colors vary, but most people apply a medium shade on the movable part of the lid (from lashes to crease) using the eye base brush and a darker color on the outer corner with the smudge brush and toward the center of the eye in the contour with the crease brush (so that it is visible when the eye is open and you are looking straight ahead with your eyebrows relaxed.). The texture eye brush is great for blending the darker crease color with the light brow bone color. 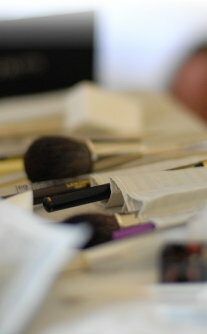 To make it seamless, finish with your still damp camouflage/concealer brush, feathering edges of color. If using cake eyeliner, or a pencil, you should apply it to the roots of the lashes. If you press a little on your eyelid to flip the lashes upward, you can fill in lash roots from the underside of the lashes. Now, from the upper side of the lashes, set the eyeliner with eyeshadow using the eyeliner/brow brush (dampened first with water). Liner under the eye can be done with the leftovers on this brush, so that it isn’t as dark as the upper liner. Peach eyeliner should be used on the inner rim of the lower lid to take away the appearance of reddened eyes. The brow can be done with pencil or powder using the dual brow brush, filling in sparse areas in the front, stroking along the highest point from the arch out, ending where the corner of the eye and the brow would intersect. Brush well afterward so that it isn’t too dark using the spoolie brush. Rub off any outlying color with a q tip. The more you brush the softer the color looks. A little face powder applied to the brow will lighten the effect if it gets too dark and set the color. Eyelashes should be curled (count to 10 when you hold the curler). Apply lash primer/conditioner to one eye, mascara over it, comb through with an empty mascara wand if you see any clumps. Then do the other eye. NOW IT IS TIME TO DO THE UNDER EYE CONCEALER. Using the camouflage/concealer brush apply the concealer under the eye, up in the corner near the nose and out to the temple area beside the eye. It is great to clean up all of the edges around the eye, including the brow area. Lips. Apply moisturizer to lips when you apply it to your face and eyes. By the time you get to your lipstick they should be softer and easier to work on. Concealer should also be applied to the edge of the lips after you do under your eyes. Then from the center out while smiling, line the lower lip. Relax your lip and from the center out, line the top. To make your lips appear fuller, color in the outer corners, top and bottom and widen the liner on the lower lip by shading. Apply the lipstick with the lip definer brush and then gloss on the center not to the sides, so that it doesn’t feather. These are general make up application guidelines. Each face requires something unique! NEW PHOTO OF BRUSHES COMING SOON!